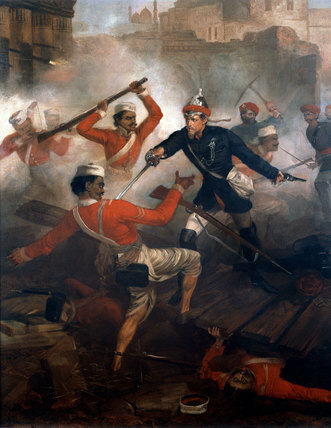 Description: Lieutenant William Alexander Kerr, 24th Bombay Native Infantry, winning the Victoria Cross near Kolapore, July 1857. Oil on canvas by Chevalier Louis-William Desanges, c. 1859.
Credit: Baloch Regimental Centre, Abbottabad. Permission: This is a faithful photographic reproduction of a two-dimensional, public domain work of art. The work of art itself is in the public domain for the following reason: This work is in the public domain in its country of origin and other countries and areas where the copyright term is the author's life plus 100 years or less. This work is in the public domain in the United States because it was published (or registered with the U.S. Copyright Office) before January 1, 1923. This file has been identified as being free of known restrictions under copyright law, including all related and neighboring rights. The official position taken by the Wikimedia Foundation is that "faithful reproductions of two-dimensional public domain works of art are public domain". This photographic reproduction is therefore also considered to be in the public domain in the United States. In other jurisdictions, re-use of this content may be restricted; see Reuse of PD-Art photographs for details.